Villa Eva is a luxury three bedroom and three bathroom villa located in the heart of Coral Bay offering private pool and modern furniture throughout and is equipped with all the necessary features for a relaxing family holiday, including a full collection of outdoor furniture, barbeque, and a sundeck with sea views. The villa will appeal to guests who seek a private villa holiday without the need to hire a car as a wide selection of restaurants, tavernas, cafes, and the beach are all within a genuine 5 to 10 minute walk away. * Modern fully fitted kitchen. * Air conditioning in the bedrooms, lounge & dining areas included in the rental rates. * Shaded outdoor lounge area. Three full sized bathrooms with one bathtub and two shower rooms. All the bathrooms are en suite and all bedrooms have direct access to the verandas. All bedrooms are air conditioned and have fitted wardrobes. All are modernly furnished. Air conditioning is available in all the bedrooms and the lounge, living, and dining areas. Living area is open plan and has direct access to the pool and shaded outdoor dining areas. TV and wi fi. A welcome pack is provided. Fully fitted kitchen which is open plan to the dining and living areas and offers washing machine and dishwasher. Granite worktops and all kitchen utensils. Notes on accommodation: To provisionally reserve the villa pending your search for suitable flights we would be happy to take the property off the market for you for a period of 3 days in order to offer some ‘breathing space’. - Once you have found suitable flights, to secure the booking we ask for a down payment of 30% and the balance 8 weeks prior to arrival. Payment can be made to us via bank transfer or through any of the major credit/debit cards - Please note for flight purposes that we ask that you move into the villa after 15.00 hours on arrival and we would like the property back by 11.00 am on the day of your departure, unless by prior arrangement. Outside: Full collection of outdoor furniture for six persons including sunbeds and umbrellas. Cleaning / Towels / Linen / Maid service: The villa is cleaned and prepared prior to each arrival and linen and towel change is available at no extra cost for stays which are for more than a week. Really difficult to say how we enjoyed our stay .... up until 6hours before we left the villia we would say we had a fantastic time.... villia was ideal as was the face to face contact we had with the owner. HOWEVER....following our last meal out we returned back to the villia and hit our beds as we had an early flight home. We woke to find that money had been stolen from two rooms and since unpacking have found that our cases have been gone through with items removed or disturbed!! Thus has left us all feeling rather sad and very disheartened with our stay. I do sympathise with you over the burglary and I have notified the local Police in Peyia to be more vigilant and more alert to the neighbourhood but thankfully, the burglaries reported in the area of Coral Bay are very few and we are now fitting an alarm system to ensure that this does not happen again. 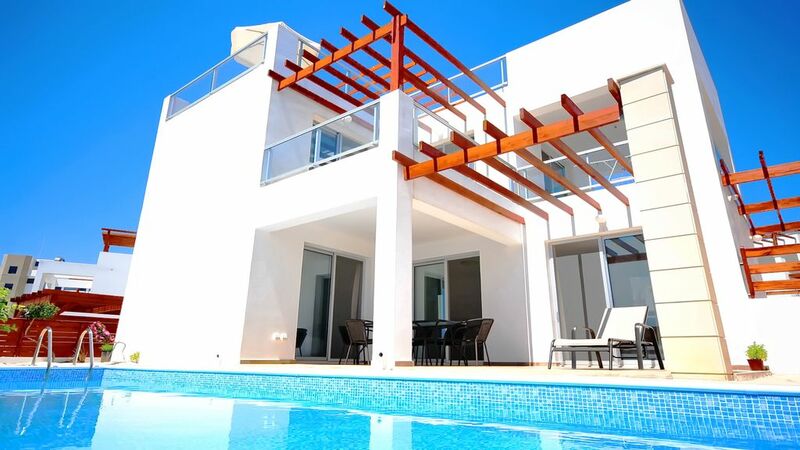 Lovely villa ideally located for the Coral Bay bars and restaurants just a 5 min walk. Villa was spotless and clean and no issues. As previous reviews have stated a mirror in the 2 upstairs bedrooms would be welcome and the TV although advertised as having UK channels us basically very limited and is in the main BBC World news, after speaking with Paul the property manager who popped along to make sure everything was fine he is trying to get the owners to look into this especially for families with children in the summer months it’s a benefit to keep them entertained inside in the middle of the day. Wonderful views from balconies and roof terrace however be aware that there is a villa adjacent to the pool area and this does slightly restrict the sea view from the terrace. Overall very enjoyable stay. Overall good, but some key things need addressing! We travelled to Cyprus for a family wedding and 6 of us stayed in the villa (all couples, no children). We had a lovely time and the villa is in a fantastic location, you can see the sea from the pool area and from the rooftop deck. The villa is located within walking distance of the main road and there are plenty of bars, restaurants and shops. Philipos supermarket is also close and they will drive you home for free when you spend 50 EUR. The welcome pack left in the fridge was very nice as it meant we had breakfast without needing to go out straightaway after we arrived. The kitchen is well equipped and I didn't struggle to cook breakfast each day for 6 people. NO MIRRORS - there are no mirrors in this villa except in the bathroom. The three girls in our villa struggled to do hair and make up each evening. Each room really needs a dressing table with a mirror near a plug to do hair/makeup, etc. Terrible beds - I travel a lot for work which means I have stayed in many types of hotel beds and these are by far the aboslute worst beds I've ever slept in. I slepty horribly the entire holiday, as did the rest of my group. Showers - the shower only bathrooms are not wet rooms, but they should be. The shower curtain and tray do not keep any of the water in, so the bathroom is flooded, even after a 5 minute shower. The manager of the property came by with some more shower curtains which helped a small amount (the original curtians were the thinnest fabric you've ever seen and the water went straight through them), but the issue is really with the trays and the water running off the sides and on to the floor. It just meant our rooms smelt of damp the whole holiday. The bathroom with a tub was absolutely fine but not ideal for 6 people to use one shower for a week when you're paying for 3. Overall, I'd stay in this villa again, but I wouldn't necessairly recommend to friends/family or if I did, I'd warn them about the above points before they booked. The Villa has 3 good sized bedrooms and 3 bathrooms. It is air conditioned throughout (on a previous stay the unit in the lounge was not working). The kitchen is well equipped. The pool is a nice size, with plenty of loungers and a table and chairs for outside eating. Our favourite place is the roof terrace, where we liked to watch the sun go down and also play cards late in the evening. The Villa is extremely well located, just a few minutes walk from the restaurants, bars and shops of the coral bay strip. There is of course, room for improvement, such as an additional hairdryer (we could only find one), a full length mirror in the main bed room would be a nice touch, as well as a stool or small piece of furniture to put things on - most of our stuff was scattered on the floor. There is also no shelf space in the bathrooms for toiletries. That said, we have already booked for next year! What a fantastic place to stay for a holiday,, everything worked well, air con was awesome,. The villa is a 5 mins walk to the bars/restaurants etc... swimming pool was lovely and warm, I hired a car and didn’t really need it as everything is nearby, did drive to Paphos which was about 15 mins away. Photos taken very clever thought we had a frontline sea view instead view from lounge over pool was another villa in your face, and each side, very crammed in. Showers flooded the room every time you used them. Many run down villas a few doors around all over grown making the area feel rather shabby, sorry for unimpressive review but location was great! The sandy beach of Coral Bay is a short walk away. The villa is located in the heart of Coral Bay and is within a short walk of banks, restaurants, tavernas, cafes, bars, and shops as well as the sandy beach of Coral Bay. Paphos International Airport is 25km away, and the nearest large town is Paphos which is located less than 10 mins by car and has a large selection of shops, restaurants and a good night life. However, most guests remain within Coral Bay which is within a 5 minute walk and offers all amenities including a sandy beach. The villa has been newly refurbished and includes new furniture, new outdoor shaded dining area overlooking the pool, and is ideal for families and first time visitors to Paphos and Coral Bay. Booking Notes: If you would like to hire a car for your holiday, we recommend a local company which will offer you a great deal on car hire. Included in their service, they meet you at the airport and deliver the car to you there. You can then follow them to the villa where they will hand over the keys to the property. Alternatively, if you would like a taxi to collect you at the airport we will send a trustworthy local taxi driver to collect you and he will have the keys to the villa for you. Changeover Day: Flexible. Notes on prices: Please note that the rental rates are inclusive of the use of air conditioning throughout the villa. Air conditioning is available in the bedrooms and in the lounge and dining areas.